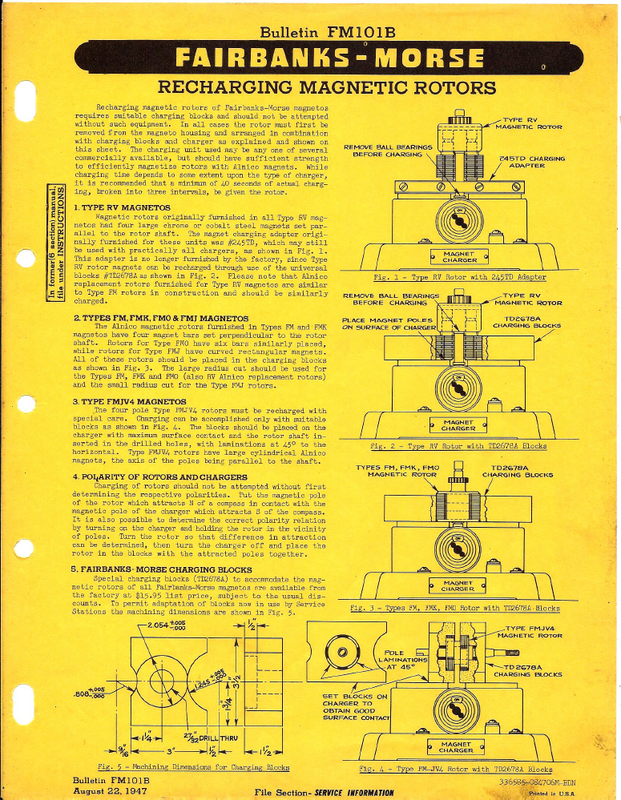 Here are some good words and wisdom to follow when you remagnetize your Fairbanks Morse magnetos. Most except the Model R use a rotating magnet. As a rule, the pole shoe of the magnetizer should be the opposite pole of the magnet being charged. The North pole of the magnet should be on the South pole of the charger. Remember that opposites attract and this applies to magnet charging. Beware of charging the magnetoc rotor with the impulse installed. The pawls can become magnetic and stick to the drive cup failing to engage causing many discouraging words and a need to demagnetize the impulse assembly. An armature growler can demag a sticky impulse. Most magnetic rotors charge the same with one notable exception, that for the V4 Wisconsin magnetos. Be sure and read the special instructions for recharging lest you discharge the magnet completely. This also applies to the FMXV4 models.